School's Out. Granny Nanny Day Care Time. Before Christmas, I took Charlotte and Ben to Bounce U, an indoor inflatables park. Something they hadn't done since school began. Ben's suggestion. I thought it was a wonderful idea with school out. All the jumping would wear them out. This inflatable is an upgrade to the old tether-ball game. The large ball shape hangs on a rope in the center, so there's no pole. The players stand on large inflated cylinders. They swing the big ball from person to person and try to knock each other off their pedestal. It's a big favorite, usually filled with players on a busy day. With the school out for a few weeks, family entertainment centers are overrun with children. The benefit at is only the children have to pay. Most adults don't play. They stare at their phone or supervise. But sometimes they bounce. Especially when attendance is low. Besides jumping and bouncing, each bay has a huge inflatable slide. Ben likes to bump as he goes down. I was lucky to get a clear picture. Part of my job as a Granny Nanny. Ben and Charlotte are not camera shy. Probably from the many Grannys they have, all taking photos. Thankfully my camera has an automatic repeat, or I would only have fuzzy photos of their bouncing and sliding. Ben and Charlotte bounced their way to flushed faces and touchable joy. The photos only show part of their glee in this Granny Nanny Day Care Time. Back from the family holiday. What a wonderful time! Family and friends coming in and going out. Those present changing in rotation. Thankfully road crews had done an excellent job removing the surprise 7 inches snow from the streets. While many food items simmered and slow cooked, giving the atmosphere a cozy feel, we played a new-to-me game, Cards Against Humanity. A party game where players complete fill-in-the-blank phrases chosen from a selection of other mature-content cards. Perhaps it could have been played to win, but the family fun was the interaction around the game. It was also an education. Some phrases, if they weren't intended to be ridiculous, used terms that were unfamiliar. I googled some to make sure I had it right. Ben and Charlotte played with some of Santa's presents until the food was ready. Besides the tasty traditional treats, there were some new recipes. A spicy cranberry chutney, my new favorite food item, gave zest to the moist turkey. After dinner and finishing the card game, it was time to open gifts. Everyone received something, with Ben and Charlotte receiving a nice haul. Desert and coffee finished the heart-warming day of good cheer. I had a great sufficiency of Christmas food, fun, friends and family. Merry Christmas to you all. Hope you enjoy the holiday's giving spirit and it finds you sharing with others. I am blessed to be with Charlotte, Ben and a dozen more for feast, good cheer, and the great present reveal. For you Create Me 365 followers, I wish you each the best of friends, family, and festivities. This was taken in 1954. Yes, I remember it well. I'm wearing my new Christmas red robe with the bunny on the pocket. A traditional present for kids in my family. Probably a way have more to open and still be useful later. Mom had many tricks like that. The wonderful, cuddly rabbit fur muff was a present I was proud to get. It was so snuggly soft. Now, I don't remember if it was from my parents or Santa. You can tell, the tree is real, because of its barren appearance. That didn't reduce the Christmas spirit it exuded. Or the pleasure we had putting it up. Mom did my haircuts. "I wasn't old enough to go to the beauty shop." Or so she said. I'm about 8 years old. Dorky hair must have been in style; I didn't question the chopped bangs. I wanted beautiful long hair. 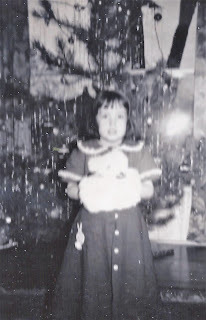 I went through hundreds of photos to find this one for Christmas Throwback Thursday. (I have more in my stash to sort. I think they multiply when I'm not looking.) 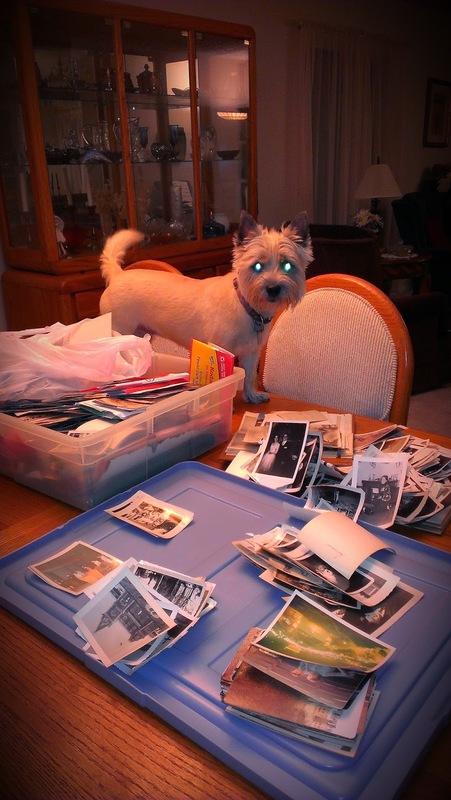 Being the youngest in my generation by 14 years, means I inherited tons of photos. I received pictures collected by my parents. Those they took and many they received. I have photos passed on from both by brothers. Then I have my own unsorted, double-print collection, as well. I'm not the great organizer my best friends are. They went through all their life's photos and scanned them to computer flash drives. Each drive was labeled by decade. They made a set for each of their children and one for themselves. A lot of work, to be sure. Also, a private, personal celebration of life and good times remembered through old photos. Here's a picture from 2008 for Throwback Thursday. It's an award I did with calligraphy and illlumination for an SCA friend, Luciana. (You know, that's the Society for Creative Anachronism). Luci received a Laurel for all the amazing Renaissance and medieval clothing she researched and made. The whole story is...Luciana received the actual award many years earlier, but not the thing. (In the SCA, we call it a "scroll".) A mutual friend finagled me into making this and even getting it given to her in court. It made it a big deal for her again. Because this award is so high in the SCA, I painted it on real vellum with gold leaf. It's done in a 1600s rich book style. The empty space is left for signatures. Unfortunately, Luci passed away a couple of years after she received this. She is so missed by all who knew her, especially her friends in Calontir. Merchants in the Great Hall. I went to Kris Kinder the yearly winter holiday shopping extravaganza for Calontir's pre-1700s reenactors in Midwest, USA. It's always bursting with quality handcrafted toys, attire, jewelry, camp gear, edibles, weapons, and armor tempting money out of 600 attendees' pockets. Yesterday, I was one who was lured by its enticements. Norse-age women showing off their spunky holiday hats. Kris Kinder readily offers you more than shopping. (Great! Because I always wish I had more to spend.) There are enticing classes, award-making meetings, food, and story-telling. (Sorry, no photos to show.) Through all this, there is time for fun, friendship, and connections. The finale is an assembly or court. It mingles serious accolades, compelling announcements, and cockeyed buffoonery. While court ends the day's formal activities, with many (including me) traveling long distances home. Others go to a private, closer home for a post-event-revel. There they sing Calontir traditional folk-style songs, tell bardic stories, exchange beverage and party on through the night. A 50th Anniversary Bash. How could it be? I can't believe my best friends celebrated their 50th Anniversary. It's not possible! I was in their wedding. How could that be that long? We double dated before we all got married. Road motorcycles together. SCUBA dived. Saw drive in movies together. Parked. That was the '60s. We have woven in and out of each others lives over those many years. Raised kids. Lived lives. Then, I moved a few hours away, eventually slowing our visits to a standstill. Being with them again, felt like the eight years I missed had not happened. In fact, because the long absence occurred, we spent hours sharing things we each missed. New or renewed hobbies and pets, new houses, kids, grandkids, travels, family deaths, and our illnesses. (Seniors talk a lot about health issues.) We talked constantly, for the few days I was there. The finale was the Open House their kids gave. So many pictures of passing years. Even more, stories to share. I knew many of their family and friends. It was good to see them all again. Their kids pulled a fast one, completely surprised them, sneaking in new friends they made while snow-birding in South Padre Island. 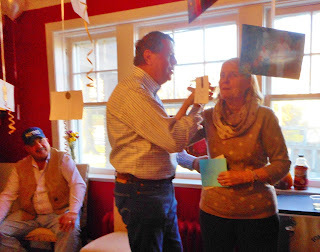 This visit for my friends 50th was extraordinary, not just because of the celebration. For me, it was about the wonderful reconnection. Being so warmly welcomed, again. Sure, in heart, it won't be the last.